Since the beginning of time the people of Ladakh which is a region in the Indian state of Jammu and Kashmir have co-existed peacefully with nature. In fact, the people who live in this part of the world worship their environment which is unsurprising given their Buddhist heritage places a lot of importance on non-violence making hunting a non-starter for many people who live there. In contrast to the rest of mainland India where encounters between humans and wildlife end up in killing, Ladakh’s residents rarely tolerate this kind of action. This means it should come as no surprise that Ladakh is home to many endangered species including snow leopards who live at an altitude of between 3000 to 5000 metres above sea level. The number of snow leopard encounters is extremely rare largely as a result of increasing tourism and the impact of global warming. WWF estimates there are between 450 to 500 snow leopards in India though the numbers that roam Ladakh are not known. The state government intends to conduct a census which will seek to map out the species habitat to improve long term conservation of the species. Despite the culture there are occasions where tensions between snow leopards and humans occur. As a predator sheep and goat make easy prey and farmers often retaliate by beating the offending cat to death. Farmers and their families in Ladakh depend on their livestock and loss of animals has a major impact. This means the first step is to ensure livestock is secured by covering barn with wire mesh and installing barbed wire which does go a long way to solving the vast majority of the problem. 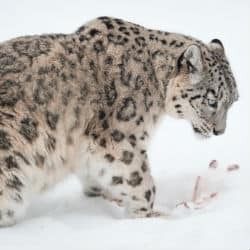 In 2011 a video was shot of a unique encounter between a snow leopard and locals which delivers a strong message about protecting endangered species. On a cold November night, the local dogs began barking outside a local family home. The house had no electricity and in almost complete darkness one member of the family woke up and decided to go outside and try and silence the barking dogs. As the man opened his kitchen door the snow leopard inside pounced. Fortunately, the snow leopard missed and in the confusion the man was able to slam the door and escape unscathed. However, when he looked back inside the kitchen, he was terrified to see a snow leopard with its characteristic spots and long tail sitting pretty inside. Neighbours later joined the family and everyone remained calm, deciding to contact police and wildlife officials to help them deal with their guest. If you watch the 15-minute-long video you will see a unique encounter between a snow leopard, locals and wildlife officials as the big cat moves around the kitchen. Officials first tranquillise the snow leopard and after the big cat is sedated, they release it back into its natural habitat. In keeping with the region’s culture, locals were happy that no hard came either to them or to the snow leopard and everything ended peacefully.